From left are Professor Changwook Lee, Hanbin Jeong, and Jumi Park in the School of Life Sciences at UNIST. Their findings appear in the October issue of the scientific journal, PNAS. A team of researchers, affiliated with UNIST has identified a new intracellular trafficking pathway of phospholipids. This pathway serves as a tunnel through which lipids are transported at inter-organellar membrane contact sites (MCSs). The discovery has great significance in the study of human diseases associated with defects in phospholipid transport. 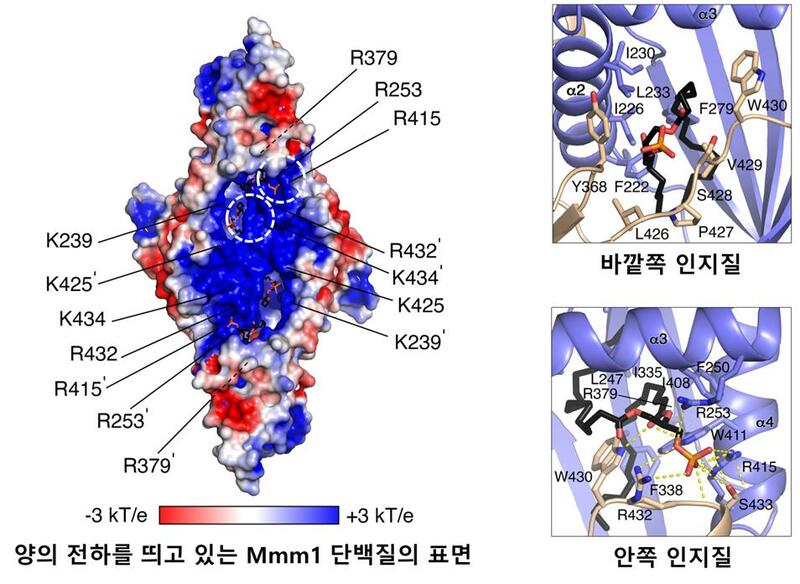 This study has been led by Professor Changwook Lee in the School of Life Sciences at UNIST. In the study, the research team has identified the trafficking mechanism of phospholipids that occurs at MCSs between the ER and mitochondria within eukaryotic cells that compose humans and other higher animals. In addition to the nucleus, eukaryotic cells may contain several other types of organelles, including mitochondria, the ER, and lysosomes. These organelles exchange cellular materials through small sacs, known as transport vesicles and this is essential for cell survival. However, new information about the nonvesicular lipid trafficking occurring at the ER-mitochondria MCS has caused researchers to carry out further research in this area. In the study, Professor Lee’s team has focused on the exchange of cellular materials between the ER and mitochondria, as these two organelles produce phospholipids without having vesicles during the exchange of materials. Thus, phospholipids must be transported from their sites of synthesis to the membranes of other organelles in some way. However, the details regarding the mechanism of the exchange of materials between these two organelles are still unknown. 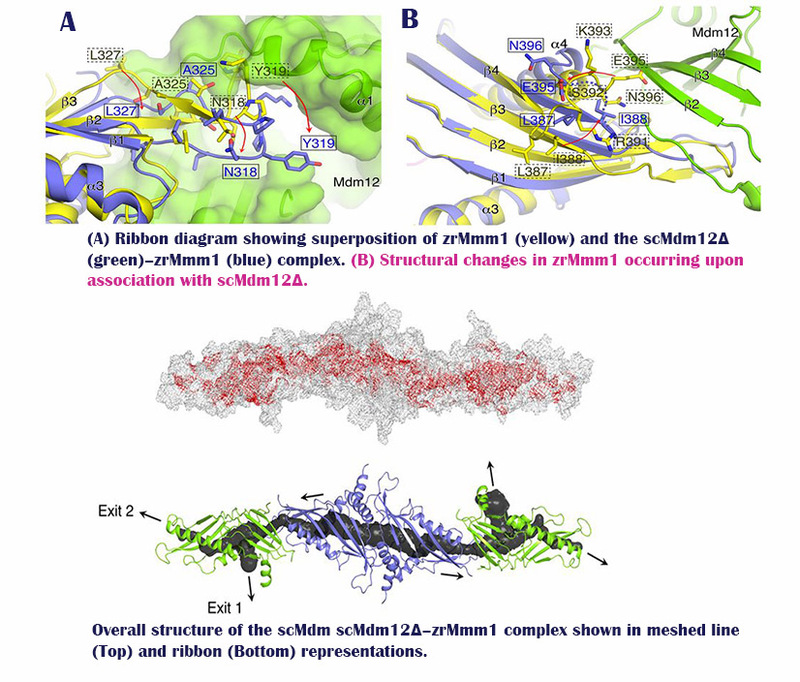 The researchers found a solution in the ER-mitochondria encounter structure (ERMES) complex comprising the ER proteins Mmm1 and cytosolic Mdm12 and the mitochondria proteins Mdm34 and Mdm10. 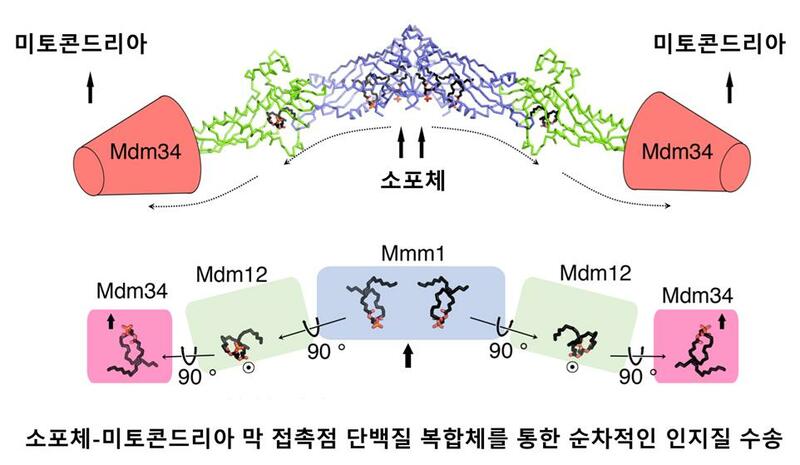 Hanbin Jeong, et al., “Crystal structures of Mmm1 and Mdm12–Mmm1 reveal mechanistic insight into phospholipid trafficking at ER-mitochondria contact sites,” (2017), PNAS.